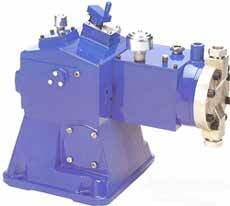 Source: Durameter Pump Company, Inc. The EV-2 and EV-3 metering pumps feature a special, heavy-duty design capable of handling all high-pressure chemical, viscous and slurry services. The EV-2 and EV-3 metering pumps feature a special, heavy-duty design capable of handling all high-pressure chemical, viscous and slurry services. Features include a sealless, single-flat diaphragm and simplex, duplex or multiplex feeds. A variety of metallic and non-metallic liquid end cartridge materials are also available. Flat double diaphragm with three levels of DURAlert leak detection. Durameter Pump Company, Inc., 9545 Hardpan Rd., Angola, NY 14006. Tel: 716-549-6600. Fax: 716-549-6250.